Proper fit can help prevent serious injuries as well as blisters, cuts, and callouses. Determining the best span, pitch, finger and thumb hole sizes requires years of industry knowledge and experience. Our expertise and service sets us apart. We stay up-to-date on the ever-evolving techniques for hand fitting. We highly recommend using a pro shop for all of your resurfacing, polishing, and cleaning needs. Our state of the art machinery allows for even application, the right amount of friction, and an ideal speed that give you the best results every time. Having your ball resurfaced professionally means consistent and precise results that support shot repeatability. Our Ebonite resurfacing machine with three Abralon pads works your entire ball at once. From 180 to 4000 grit, we remove scratches, gouges, and ball track, bringing your equipment back to factory finish. Our dual speed ball spinner can help you achieve an optimal polished surface. Is your ball losing momentum? 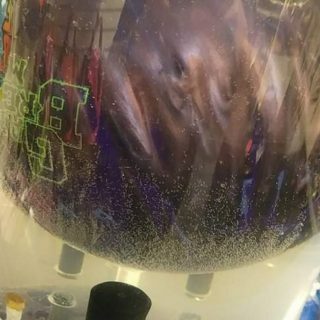 Extract oil and deep clean with the only Ebonite PowerHouse Wave Machine in Orlando! This two hour process uses water heated to a consistent temperature that safely sweats the oil out of the ball without cracking. 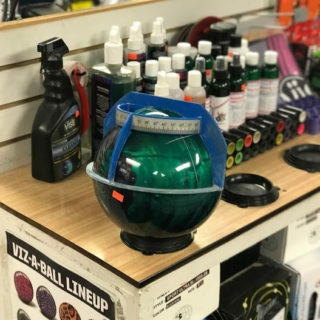 Want to make your ball like new again? We recommend resurfacing & deep cleaning together. Resurfacing takes care of the outer layer of the ball. The Wave machine penetrates the cover stock, pulling oil out of the microscopic crevices for a truly deep cleaning. Save $10 when purchased at the same time! Watch this USBC produced video to learn more about all of the steps that we take in our drilling process. 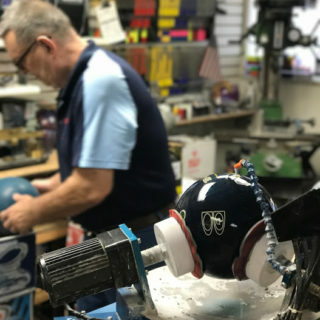 Want your name on your bowling ball? We do engravings! The cost is $5 for up to 7 letters.